On confirmation of a tour, full lists of required gears would be sent to you or please view our Gear List section on website. How do I prepare myself for the physical requirement of the trek? An average physical fitness should be maintained on prior of booking a trek. Any sort of illness or recent medical problems should be mentioned while booking a trip. Most of our itineraries are prepared to give you a maximum time to acclimatize and pace setting on the treks would be done according to your convenience. Can I customize trips to make them suite me? We always try to be flexible with our trips for our client’s convenience. We are open to changes on the trips as long as the proposed itinerary does not harm your own chances of acclimatization on the trips. A trip can be booked as far as one year in advance. We do not book more than one year ahead because of possibility of huge fluctuations in the international exchange rate. Autumn: From Early October to mid- December are most favorable months for trekking. The mountains scenery is cleared. Temperatures are pleasant, feeling hot during the day. The nights are colder. Many tourists are on trek. Winter: January – February. The weather always cleared but cold temperatures. Most of the passes are covered by snow. It is appropriate period for the Kathmandu valley trek. Spring: The temperatures are very pleasant also increase gradually. The hills are blooming with rhododendron forests. It is very good period for trekking early March to mid-May. Summer: June to mid- September is monsoon season with frequent rainfall. 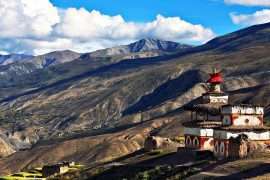 This is best season for Trans Himalayas trek like Dolpo and Mustang.